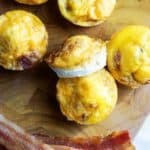 Bacon Egg Muffin Cups: Breakfast On The Go! You can grab a couple before you head out the door and microwave them at work or eat them right in the car. They are the perfect accessory for the hand you won’t be using on the steering wheel hehe. Egg Cups with Bacon: Fill Them However You Want! This recipe was featured in Womens Health Magazine! Bake egg cups for 25-30 minutes at 350 degrees.